Géza II (Hungarian: II. 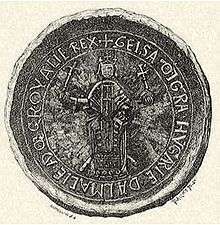 Géza; Croatian: Gejza II; Slovak: Gejza II; 1130 – 31 May 1162) was King of Hungary and Croatia from 1141 to 1162. He was the oldest son of Béla the Blind and his wife, Helena of Rascia. When his father died, Géza was still a child and he started ruling under the guardianship of his mother and her brother, Beloš. A pretender to the throne, Boris Kalamanos, who had already claimed Hungary during Béla the Blind's reign, temporarily captured Pressburg (now Bratislava in Slovakia) with the assistance of German mercenaries in early 1146. In retaliation, Géza, who came of age in the same year, invaded Austria and routed Henry Jasomirgott, Margrave of Austria, in the Battle of the Fischa. Géza was born the eldest son of Béla the Blind, a cousin of King Stephen II of Hungary, and Helena of Raška in 1130. Géza's father had been blinded, together with his rebellious father, Álmos, in the 1110s on the order of Stephen II's father, Coloman, King of Hungary, who wanted to ensure Stephen's succession. When Géza was born, his parents lived on an estate that King Stephen had granted them in Tolna. Géza's father succeeded King Stephen in the spring of 1131. In the same year, Queen Helena took Géza and his younger brother, Ladislaus, to an assembly held at Arad, where she ordered the massacre of sixty-eight noblemen "by whose counsel the King had been blinded", according to the Illuminated Chronicle. King Béla died on 13 February 1141 and Géza succeeded him without opposition. The eleven-year-old Géza was crowned king on 16 February. During his regency, his mother and her brother, Beloš, ruled the kingdom in the first years of his reign. One of Géza's first charters, issued in 1141, confirmed the privileges of the citizens of Split in Dalmatia. In the charter, Géza is titled as "By the Grace of God, King of Hungary, Dalmatia, Croatia and Rama". According to historian Paul Stephenson, the towns of central Dalmatia—including Šibenik and Trogir—accepted Géza's suzerainty after a Hungarian invasion around 1142. Hungarian troops assisted Prince Volodimerko of Halych—who had been the ally of Géza's father against the pretender Boris—when Great Prince Vsevolod II of Kiev invaded Halych in 1144. Although the Hungarian auxiliaries "were of no use whatsoever", according to the Hypatian Codex, the grand prince could not occupy Volodimerko's principality. Boris was the son of Eufemia of Kiev, King Coloman of Hungary's second wife, whom the king expelled on the charge of adultery before Boris's birth. According to the chronicler Bishop Otto of Freising, Boris approached Conrad III of Germany to seek his assistance against Géza at the end of 1145. Upon the recommendation of Vladislav II of Bohemia, the German monarch authorized Boris to muster an army of mercenaries in Bavaria and Austria. Boris stormed Hungary and took the fortress of Pressburg (present-day Bratislava in Slovakia). The royal forces soon imposed a blockade on the fortress and convinced Boris's mercenaries to surrender without resistance in exchange for compensation. The Hungarians blamed Conrad III for Boris's attack and decided to invade the Holy Roman Empire. Before crossing the river Lajta (now Leitha in Austria), which marked the western border of Hungary, the sixteen-year-old Géza was girded with a sword in token of his coming of age. In the Battle of the Fischa on 11 September, the Hungarian army under the command of Géza and Beloš routed the German troops led by Henry Jasomirgott, Margrave of Austria. Géza married Euphrosyne, sister of Grand Prince Iziaslav II of Kiev, in the second half of 1146. German–Hungarian relations remained tense as Boris attempted to take advantage of Conrad III's decision to lead a crusade to the Holy Land through Hungary. However Géza, who knew that "he could conquer more easily by gold than by force, poured out much money among the Germans and thus escaped an attack from them," according to the chronicler Odo of Deuil. The German crusaders marched across Hungary without major incident in June 1147. The Illuminated Chronicle relates that some Hungarian noblemen promised Boris "if he could make his way into the kingdom, many would take him for their lord and, deserting the King, would cleave to him." Boris convinced two French noblemen to assist by hiding him among the French crusaders who followed the Germans towards the Holy Land. King Louis VII of France and his crusaders arrived in Hungary in August. Géza learnt that his opponent was with the French and demanded his extradition. Although Louis VII rejected this demand, he held Boris in custody and "took him out of Hungary," according to Odo of Deuil. Having left Hungary, Boris settled in the Byzantine Empire. Disputes among European powers led to the formation of two coalitions in the late 1140s. One alliance was formed by the Byzantine Emperor Manuel I Komnenos and Conrad III against Roger II of Sicily who had invaded Byzantine territories. Géza sided with Roger II and his allies, including the rebellious German prince, Welf VI and Uroš II of Rascia. Géza sent reinforcements to his brother-in-law, Grand Prince Iziaslav II, against Prince Vladimir of Chernigov in the spring of 1148. The Serbs of Rascia rebelled in 1149, forcing Emperor Manuel I to interrupt his preparations for an invasion of Southern Italy and invade Rascia in 1149. According to the emperor's panegyrist Theodore Prodromus, Hungarian forces supported the Serbs during the emperor's campaign. 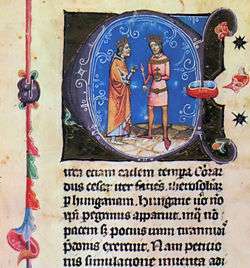 The Hypatian Codex says that Géza referred to his war against Emperor Manuel when excusing himself for refusing to send reinforcements to Iziaslav II whom Yuri Dolgorukiy, Prince of Suzdal, expelled from Kiev in August 1149. Hungarian auxiliaries supported Iziaslav II to reoccupy Kiev in the early spring of 1150, but before long Yuri Dolgorukiy expelled Iziaslav from the town. In autumn, Géza led his army against Volodimirko of Halych, who was Yuri Dolgorukiy's close ally. He captured Sanok, but Volodimirko bribed the Hungarian commanders, who persuaded Géza to leave Halych before November. A "countless allied force of Hungarian cavalry as well as of the heterodox Chalisoi" had supported the Serbs in the same year, according to the contemporaneous John Kinnamos, but the Byzantine army routed their united troops on the river Tara in September. The Byzantine victory forced Uroš II of Rascia to acknowledge the emperor's suzerainty. Emperor Manuel launched a retaliatory campaign against Hungary and ravaged the lands between the rivers Sava and Danube. Assisted by Byzantine troops, the pretender Boris also broke into Hungary and devastated the valley of the river Temes. Géza, who had just returned from Halych, did not want to "involve the remaining Hungarian force in destruction" and sued for peace. The peace treaty was signed in late 1150 or early 1151. Géza met Henry Jasomirgott which contributed to the normalization of their strained relations in 1151. He sent reinforcements to Iziaslav II who again reoccupied Kiev before April 1151. Three months later, Volodimirko of Halych routed a Hungarian army that was marching towards Kiev. Frederick Barbarossa, the newly elected King of Germany, demanded the German princes' consent to wage war against Hungary at the Imperial Diet of June 1152, but the princes refused him "for certain obscure reasons", according to Otto of Freising. Géza invaded Halych in the summer of 1152. The united armies of Géza and Iziaslav defeated Volodimirko's troops at the San River, forcing Volodimirko to sign a peace treaty with Iziaslav. Pope Eugenius III sent his envoys to Hungary to strengthen the "faith and discipline" of the Hungarian church. Géza forbade the papal envoys to enter Hungary, which shows that his relationship with the Holy See had deteriorated. Géza planned to invade Paristrion—the Byzantine province along the Lower Danube—in the spring of 1153. According to John Kinnamos, Géza sought vengeance for Manuel's invasion of 1150; on the other hand, Michael of Thessalonica wrote that Géza prevented Emperor Manuel from invading Southern Italy. However, the emperor, who had been informed of Géza's plan, marched to the Danube. Géza sent his envoys to the emperor and a new peace treaty was signed in Sardica (now Sofia in Bulgaria). In accordance with the peace treaty, the Byzantines released their Hungarian prisoners of wars, according to Abū Hāmid al-Gharnātī, a Muslim traveler from Granada who lived in Hungary between 1150 and 1153. Abū Hāmid stated that every country feared Géza's attack, "because of the many armies he has at his disposal and his great courage". The Muslim traveler observed that Géza employed Muslim soldiers who had been recruited from among the peoples of the Eurasian steppes. Abū Hāmid even urged the soldiers to make "every effort to go on jihad" with Géza "for thus God [would] set down the merit of Holy War to [their] account". Géza allowed his Muslim subjects to take concubines, which stirred up the Hungarian clergy. He also invited Western European (primarily German) knights to settle in Hungary. For instance, he made a land grant to two knights, named Gottfried and Albert, who had "abandoned their homeland" upon his invitation in the 1150s. Some years earlier, one Hezelo of Merkstein sold his patrimony in the region of Aachen before departing to Hungary from where he never returned to his homeland. According to the Diploma Andreanum of 1224, which spelled out the privileges of the Transylvanian Saxons, their ancestors were invited by Géza to settle in southern Transylvania. Pope Anastasius IV declared Géza's rule in Dalmatia unlawful in October 1154. Emperor Manuel's cousin, Andronikos Komnenos, who administered Belgrade, Braničevo and Niš sent a letter to Géza in 1154, offering to hand over those towns to Géza in exchange for Géza's support against the emperor. Géza sent his envoys to Sicily to sign a new alliance with William I of Sicily around the end of the year, but William I was fighting with his rebellious subjects. Although Andronius Komnenus's plot was discovered and he was captured, Géza invaded the Byzantine Empire and laid siege to Braničevo in late 1154. After hearing of the imprisonment of Andronikus Komnenos, Géza abandoned the siege and returned to Hungary. A Byzantine general, Basil Tzintziluces, launched an attack on the Hungarian army, but Géza annihilated the Byzantine forces before returning to Hungary. In early 1155, the Byzantine and Hungarian envoys signed a new peace treaty. In the same year, a Byzantine army expelled Géza's ally, Desa, from Rascia and restored Uroš II, who had promised that he would not enter into an alliance with Hungary. Frederick Barbarossa, who had been crowned Holy Roman Emperor, received the envoys of Manuel I in Nuremberg in July 1156. The Byzantine envoys proposed a joint invasion of Hungary, but Barbarossa refused their offer. On 16 September, Barbarossa stipulated that the dukes of Austria were to support the Holy Roman emperors during a war against Hungary in his charter by which he elevated Austria to a duchy, showing that the relationship between Hungary and the Holy Roman Empire was still tense. Barbarossa's close advisor, Daniel, Bishop of Prague, visited Hungary in the summer of 1157. On this occasion, Géza promised that he would support Barbarossa with auxiliary troops if the emperor invaded Italy. Géza's youngest brother, Stephen, started conspiring with their uncle, Beloš, and other lords against Géza, according to the nearly contemporaneous Rahewin. To avoid a civil war, Géza first ordered the persecution of Stephen's partisans, then had his rebellious brother expelled from the kingdom and even sentenced to death. 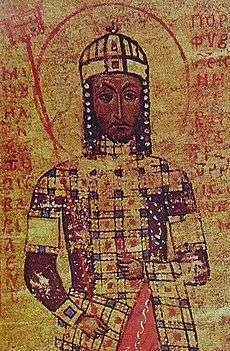 Niketas Choniates also recorded that Stephen had been "forced to flee from the murderous clutches" of Géza. Géza's uncle, Beloš, was not mentioned in royal charters issued after March 1157, which suggest that he left Hungary after that date. During the summer of that year, Stephen fled to the Holy Roman Empire, seeking Emperor Frederick's protection against Géza. Upon the emperor's demand, Géza accepted Frederick Barbarossa as arbitrator in his conflict with Stephen and sent his envoys to Regensburg in January 1158. However, Barbarossa "decided to defer to a more suitable time the settlement" of the quarrel between Géza and Stephen and departed for his campaign against the Lombard League. In accordance with his former promise, Géza sent a troop of 5–600 archers to accompany the emperor to Italy. Before long, Géza's brother, Stephen, left for the Byzantine Empire and settled in Constantinople where he married Emperor Manuel's niece Maria Komnene. Within two years, he was joined by his brother, Ladislaus, who fled from Hungary around 1160. Frederick Barbarossa forced the Italian towns to surrender in September 1158. However, Milan and Crema again rose up in open rebellion against the emperor's rule after the Diet of Roncaglia ordered the restoration of imperial rights, including the emperor's rights to levy taxes in the Northern Italian towns. Géza sent his envoys to Barbarossa's camp and promised to dispatch further reinforcements against the rebellious towns. The death of Pope Adrian IV on 1 September 1159 caused a schism, because the college of the cardinals was divided: the majority of the cardinals was opposed to Barbarossa's policy, but a minority supported him. The first group elected Alexander III pope, but Barbarossa's supporters chose Victor IV. Emperor Frederick summoned a synod to Pavia to put an end to the schism. Géza sent his envoys to the church council where Victor IV was declared the lawful pope in February 1160. However, Lucas, Archbishop of Esztergom, remained loyal to Alexander III and persuaded Géza to start negotiations with the representatives of Alexander III. Géza only decided to change sides after most European monarchs, including the kings of Sicily, England and France, joined Alexander III. Géza's envoys announced his decision to Alexander III in early 1161, but Géza only informed the emperor of his recognition of Alexander III in the autumn of the same year. Géza's and Alexander III's envoys signed a concordat in the summer of 1161. According to that treaty, Géza promised that he would not depose or transfer prelates without the consent of the Holy See; on the other hand, the pope acknowledged that no papal legates could be sent to Hungary without the king's permission and the Hungarian prelates were only allowed to appeal to the Holy See with the king's consent. He also signed a truce for five years with the Byzantine Empire. Shortly before his death, Géza granted Dalmatia, Croatia and other territories to his younger son, Béla, as an appanage duchy. Géza died on 31 May 1162 and was buried in Székesfehérvár. Géza's wife, Euphrosyne of Kiev, was a daughter of Grand Prince Mstislav I of Kiev. She survived Géza and died around 1193. Their first child, Stephen, was born in the summer of 1147; he succeeded Géza in 1162. 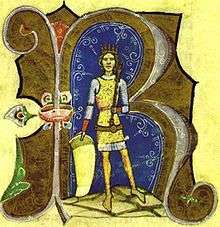 His younger brother, Béla, was born in about 1148; he inherited Hungary after the death of Stephen in 1172. Géza's third son and namesake, Géza, was born in the 1150s. The youngest son of Géza and Euphrosyne, Árpád, did not survive childhood. Géza's and Euphrosyne's oldest daughter, Elizabeth, was given in marriage to Frederick of Bohemia, who was the heir to Vladislaus II, Duke of Bohemia, in 1157. The second daughter, Odola, married Vladislaus II of Bohemia's younger son, Sviatopluk, in 1164. The third daughter of Géza and Euphrosyne, Helena, became the wife of Leopold V of Austria in 1174. 1 2 3 4 5 Kristó & Makk 1996, p. 175. ↑ Makk 1994, p. 236. ↑ Engel 2001, p. 35. ↑ Engel 2001, pp. 35,50. ↑ Kristó & Makk 1996, p. 166. 1 2 3 4 Engel 2001, p. 50. ↑ Makk 1989, p. 35. 1 2 3 4 5 6 7 Makk 1989, p. 36. ↑ Stephenson 2000, p. 226. ↑ Dimnik 1994, p. 401. ↑ Dimnik 1994, pp. 401–402. 1 2 Bartl et al. 2002, p. 29. ↑ Kristó & Makk 1996, p. 178. 1 2 Makk 1989, p. 39. ↑ Kristó & Makk 1996, pp. 178–179. ↑ Makk 1989, p. 41. ↑ Makk 1989, pp. 39–40. ↑ Odo of Deuil: De Profectione Ludovici VII in Orientem: The Journey of Louis VII to the East, p. 35. 1 2 3 4 5 6 7 Makk 1989, p. 40. ↑ Runciman 1951, p. 260. ↑ The Hungarian Illuminated Chronicle (ch. 166.120), p. 138. ↑ Runciman 1951, pp. 262–263. ↑ Makk 1989, pp. 42, 44–45. ↑ Makk 1989, pp. 44–45. ↑ Fine 1991, p. 236. 1 2 Fine 1991, p. 237. ↑ Makk 1989, pp. 45–46. 1 2 3 Makk 1989, p. 47. ↑ Stephenson 2000, p. 224. 1 2 Makk 1989, p. 50. ↑ Stephenson 2000, p. 225. ↑ Dimnik 2003, pp. 62–63. ↑ Deeds of John and Manuel Comnenus by John Kinnamos (3.8), p. 86. ↑ Stephenson 2000, p. 225-226, 230. ↑ Fine 1991, pp. 237–238. 1 2 3 4 Stephenson 2000, p. 230. ↑ Makk 1989, p. 55. 1 2 3 4 Makk 1989, p. 56. ↑ Deeds of John and Manuel Comnenus by John Kinnamos (3.11), p. 94. 1 2 Makk 1989, p. 57. 1 2 3 4 Érszegi & Solymosi 1981, p. 110. ↑ The Deeds of Frederick Barbarossa (2.6), p. 119. ↑ Makk 1989, pp. 56–57. 1 2 3 Stephenson 2000, p. 232. 1 2 3 4 Makk 1989, p. 58. ↑ The Travels of Abū Hāmid al-Andalusī al-Gharnātī, 1130–1155, pp. 82–83. 1 2 3 4 5 Engel 2001, p. 51. ↑ Engel 2001, pp. 64–65. ↑ The Travels of Abū Hāmid al-Andalusī al-Gharnātī, 1130–1155, p. 81. 1 2 3 Kristó & Makk 1996, p. 185. ↑ Fügedi & Bak 2012, p. 323. ↑ Sălăgean 2005, p. 162. ↑ Sălăgean 2005, p. 163. ↑ Stephenson 2000, p. 228. ↑ Makk 1989, p. 60. 1 2 3 4 Makk 1989, p. 61. ↑ Stephenson 2000, p. 231. ↑ Makk 1989, pp. 60–62. ↑ Stephenson 2000, pp. 233–234. ↑ Fine 1991, p. 238. 1 2 Érszegi & Solymosi 1981, p. 111. 1 2 Makk 1989, pp. 63–64. 1 2 3 4 5 Makk 1989, p. 65. ↑ Kristó & Makk 1996, p. 188. 1 2 Makk 1989, p. 66. ↑ O City of Byzantium, Annals of Niketas Choniates (4.126) , p. 72. 1 2 Makk 1989, p. 68. 1 2 Makk 1989, p. 69. ↑ The Deeds of Frederick Barbarossa (3.13), p. 188. ↑ Érszegi & Solymosi 1981, p. 112. ↑ Stephenson 2000, p. 247. ↑ Makk 1989, p. 76. ↑ Fuhrmann 1986, p. 147. 1 2 3 Makk 1989, p. 71. ↑ Fuhrmann 1986, pp. 147–148. ↑ Fuhrmann 1986, pp. 148–149. 1 2 Fuhrmann 1986, p. 149. ↑ Makk 1989, p. 72. ↑ Makk 1989, pp. 72–73. ↑ Makk 1989, pp. 73, 75. ↑ Engel 2001, p. 52. ↑ Makk 1989, p. 73. ↑ Makk 1989, pp. 73–74. 1 2 Makk 1989, p. 75. 1 2 Kristó & Makk 1996, p. 189. ↑ Makk 1989, p. 77. ↑ Kristó & Makk 1996, p. 175, Appendices 2–3. ↑ Kristó & Makk 1996, p. 182, Appendix 3. ↑ Kristó & Makk 1996, p. 194, Appendix 3. ↑ Makk 1989, p. 139. ↑ Kristó & Makk 1996, pp. 190–191, Appendix 3. ↑ Kristó & Makk 1996, p. 205, Appendix 3. 1 2 3 4 5 Kristó & Makk 1996, p. 190, Appendix 3. ↑ Makk 1989, p. 89. ↑ Makk 1989, p. 111. Odo of Deuil: De Profectione Ludovici VII in Orientem: The Journey of Louis VII to the East (Edited with an English Translation by Virginia Gingerick Berry) (1948). Columbia University Press. The Deeds of Frederick Barbarossa by Otto of Freising and his Continuator, Rahewin (Translated and annotated with an introduction by Charles Christopher Mierow with the collaboration of Richard Emery) (2004). Columbia University Press. ISBN 0-231-13419-3. "The Travels of Abū Hāmid al-Andalusī al-Gharnātī, 1130–1155". In Ibn Fadlān: Ibn Fadlān and the Land of Darnkess: Arab Travellers in the Far North (Translated with an Introduction by Paul Lunde and Caroline Stone) (2012). Penguin Books. ISBN 978-0-140-45507-6. Fügedi, Erik; Bak, János M. (2012). "Foreign Knights and Clerks in Early Medieval Hungary". In Berend, Nóra. The Expansion of Central Europe in the Middle Ages. Ashgate Variorum. pp. 319–331. ISBN 978-1-4094-2245-7. Fuhrmann, Horst (1986). Germany in the high middle ages, c. 1146–1246. Cambridge University Press. ISBN 0-521-31980-3. Makk, Ferenc (1994). "II. Géza". In Kristó, Gyula; Engel, Pál; Makk, Ferenc. Korai magyar történeti lexikon (9–14. század) [Encyclopedia of the Early Hungarian History (9th–14th centuries)] (in Hungarian). Akadémiai Kiadó. p. 236. ISBN 963-05-6722-9. Runciman, Steven (1951). A History of the Crusades, Volume II: The Kingdom of Jerusalem and the Frankish East 1100–1187. Cambridge University Press. ISBN 0-521-06162-8. Wikimedia Commons has media related to Géza II of Hungary.